Akron offers a reminder that immigration simply looks like people from various places living side by side. AKRON, Ohio ― Akron owes its only population growth since the turn of the century to a kingdom on the other side of the Earth. As many as 5,000 Nepalis, who held onto their culture during centuries in Bhutan and decades in refugee camps in Nepal, have made their way here during the last decade. They went to work in the Gojo plant, enrolled their kids in public schools and learned how to navigate roads, snow and U.S. society. But real success in resettling refugees “means moving people from surviving to thriving,” says Eileen Wilson, who runs refugee outreach for a Cleveland agency called Building Hope in the City. Family Groceries in Akron, Ohio. Thriving means different things to different people. In Akron, it’s come to mean a dozen Nepalese shops and restaurants in what were once abandoned storefronts on North Hill. It means neighborhoods where long-slumping home sales are recovering. It means a cricket pitch in the park, a Nepalese bed-and-breakfast, and the migration of refugees from Houston, Atlanta, Chicago and New York ― the kinds of places Akron is used to losing people to. It also means that a once alarmingly high suicide rate among refugees has dwindled. Akron has declared itself a “Welcoming Community,” and Deputy Mayor Annie McFadden says the city and its newest residents are establishing a synergy. Thirty-nine-year-old Amber Subba has lived the Akron migration story from the beginning. On his Facebook page, he introduces himself as Bhutanese-Nepali-American. Subba and his family came to Akron in 2008. They’d spent more than 17 years in a refugee camp in Nepal. They’d been forced there when he was 11 by the Bhutanese government’s campaign for a national identity ― one that had no room for people of Nepalese descent who held onto their language and culture. As refugee camps go, Subba says, the seven clustered in southwest Nepal weren’t bad: Refugees organized systems of commerce, education and self-governance. But more than 100,000 people were also living with annual monsoons and periodic fires, little privacy and constant uncertainty, including how much longer Nepal would let them stay. In late 2006, President George W. Bush surprised the refugee resettlement world by announcing the U.S. would accept up to 60,000 Bhutanese refugees. Most of America barely noticed, but local, federally chartered agencies like the International Institute of Akron started to make plans. Subba acknowledges his adopted city wasn’t exactly prepared. Jobs were scarce. Language was the great isolator. The laws and customs were unknown. Amber Subba plays music at home in Cuyahoga Falls, Ohio. In fact, Subba did quite a bit more than survive. He rose from interpreter to case manager at the institute, became a U.S. citizen and was president of the Bhutanese Community Association of Akron. He composes folk music ― love songs played on streaming radio and easily recognized in the world of the Nepalese diaspora. His was the first marriage outside the tight circle of Akron’s Bhutanese community. His wife, Tiffany Ann Stacy, enjoys their definition of family that extends well beyond their two children. Tiffany Ann Stacy holds her son at home in Cuyahoga Falls, Ohio. Stacy, born in the U.S., lives with her husband from Nepal, their children and his parents. There was a time when she and her husband worried about too many of the refugees being lonely. 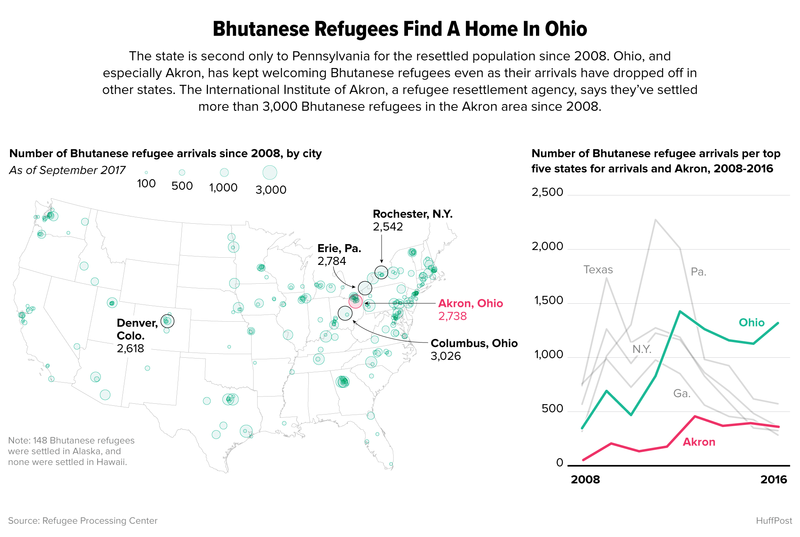 Between 2012 and 2015, a dozen Northeast Ohio Bhutanese refugees died by suicide. The entire community knew stories of others who had tried. Dhan Tumbapoo, Amber Subba's father, makes tea at home. He lives with his wife, son, his son's wife and their two children. Nationally, the suicide rate among the Bhutanese refugees was running twice that of the general population. A 2012 study by the U.S. Centers for Disease Control and Prevention said it was also higher than among other refugee groups. 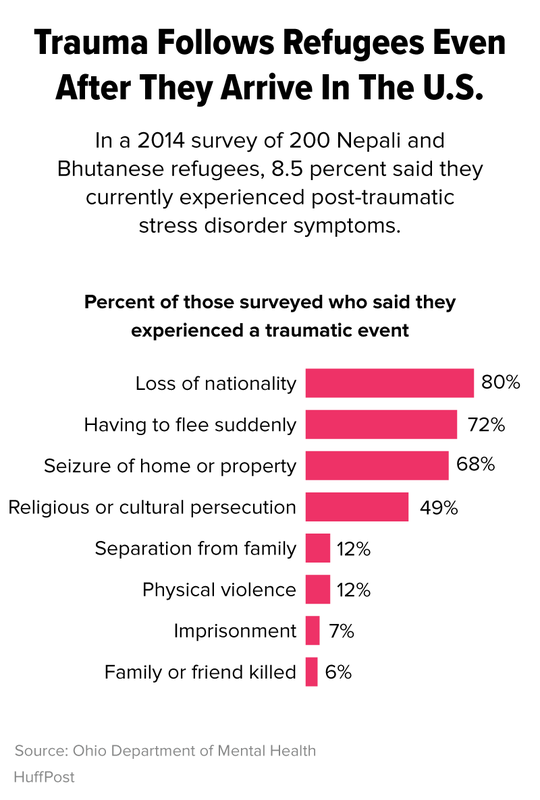 And a study by the Ohio Department of Mental Health found that 8.5 percent of Ohio’s Bhutanese refugees had post-traumatic stress disorder, 30 percent had anxiety and 26 percent had depression. Subba launched Akron’s “Stop Suicide” effort in 2014. The focus was addressing isolation, especially among older refugees. Ash Maya Subba understands the feeling but, at least these days, not the reluctance to talk about it. Ash Maya (no relation to Amber) is a 64-year-old mother of six grown children. She came to Akron in 2012. Through Bersha Ghimirey, one of the kids in the community who often serve as informal interpreters, she described a bewildering and isolating time. Ash Maya had woven in the camps, on what are called backstrap looms – one part straps around your back, another around a tree, and you create the fabric in between. In 2010, husband and wife Terry and Liz Kuhn were just becoming aware of the growing Bhutanese community in Akron. Liz has a master’s degree in weaving, and they extended an open invitation to the group to talk about the craft. They expected a dozen people. It turned out to be closer to 50. This group evolved into the nonprofit Woven in Exile. Via Bersha, Ash Maya said the group saved her. Colorful textiles are sold at The Exchange House in Akron, Ohio. These days, the core group, including Ash Maya, is also turning out high-end weekender bags through Woven in Exile’s partnership with another nonprofit, Girl Set Free. For others, the community’s Stop Suicide effort included big public events and private, informal networks ― things like casual stop-ins with people who were isolated. A local agency called Asia Inc. began biweekly mental health gatherings for older people in the community. A typical session is part dance, part meal and part group therapy. Last year, the medical examiner listed just two suicides among Summit County’s entire Asian-American population. Amber Subba is pleased. But just as important as the special efforts, he says, are the gradual changes in which refugees took more ownership of the city ― literally. Refugees accounted for over 40 percent of the sales of owner-occupied homes in the North Akron zip code last year, and paid four of the top five prices. The Family Groceries store sells many types of ethnic food in Akron, Ohio. One of those places where people are meeting is the Himalayan Music Academy. It’s in a plain block building, upstairs from a karate studio and T-shirt shop. It’s not much to look at, but a lot to listen to. All day on Saturdays and Sundays, children and adults are learning or perfecting the elaborate movements of classical, folk and modern Nepalese dance – with hip-hop occasionally blended in. In two rooms behind that, others learn to play the traditional instruments madal and bansuri, along with keyboard, drums and guitar. The academy’s founder, Puspa Gajmer, is 32, a small man with a soft voice ― except when he sings. He trained in classical music in India and Nepal before moving to Chicago in 2011. Two years later, he came to Akron, drawn by family and the city’s reputation among the international Nepalese community. For Gajmer, who’s also an interpreter and auditor in a metallurgical lab, music is key to making life in the U.S. work for his community ― and vice versa. By that, he means Akron’s culture. And he thinks the city that spawned the unique punk rock Akron Sound of the ’70s ― think Devo, Tin Huey, the Bizarros and Rubber City Rebels ― might be ready for a new sound. Meanwhile, he’s teaching everything from traditional Nepalese folk songs to hip-hop to kids like Sawan Subba (again, no relation). She’s tall for a fourth-grader. She’s also a good enough dancer to join the older girls’ rehearsal of a modern piece. But classical Nepalese dance ― a whirl of feet, hips and hands that tell stories ― is her passion. But before dance comes the alphabet. Gopal Ghatani spends an hour drilling the children on the 36 letters and silent vowels of the Nepalese alphabet. He explains that many of the refugee families couldn’t read and write in their native language, and the focus of Akron’s schools is English immersion. That’s fine, he says. But that can’t be everything. The Exchange House, a combined B&B and community center in Akron, Ohio. Gordon and Diane Keckler, who are in their 60s, live across from the Exchange House. It’s a plain-frame two-story, like a lot of others in North Hill’s aging housing stock. But it’s been transformed into a combination B&B and community center. The Kecklers love it, and they love the seven Nepalese families they’ve met in the neighborhood. “They filled in the vacant houses, storefronts, and they’re really friendly, family-oriented people who take care of their elderly,” Diane said. But they acknowledge tensions with some older North Hill natives, who object to the hand-hewn porch railings and profusions of peppers, tomatoes and marigolds growing in buckets in front of Nepalese houses. “And they complain that they walk all the time, every day,” Gordon said, laughing. The city has tried to ease those kinds of tensions through the North Hill churches, block-watch meetings and things as mundane as re-striping and narrowing one of the major city streets so cars slow down and walkers can move more quickly to the other side. McFadden, the deputy mayor, says Akron is also working with Summit County and with the International Institute and Asia Inc. on a plan to define the practical things that go into being a “Welcoming Community.” The first phase is due this month. But there’s also nervousness about the impact of the national political debate over refugees. President Donald Trump’s travel ban never targeted Nepalis. But his earlier orders have cut back drastically on the number of refugees of any type allowed in the U.S., and last week, he announced an annual cap of 45,000 refugees ― about a third the level set by former President Barack Obama. Akron, which had been preparing for an influx from Syria, has seen that possibility disappear; the International Institute has laid off some staff members, and others, like Amber Subba, have moved on to other jobs with a more certain future.